( Inn to INN walking), we eat and sleep in those simple lodges in the mountains. The other one is the camping trek means a tented trek we organize with whole trekking crew, also called organized trek ( camping trek ) Or some are village home stay treks, in local people's house in the mountains of Nepal. The classic style of trekking in Nepal and can be conducted almost anywhere in the country. 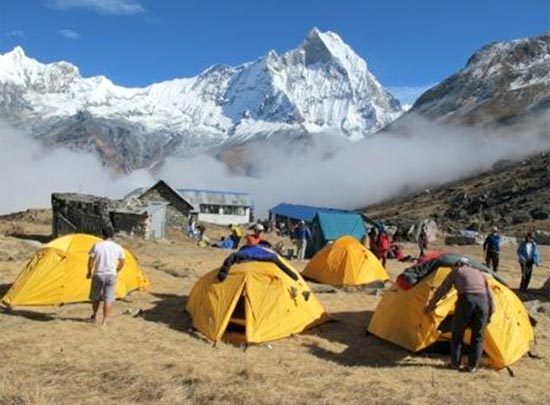 Camping trekking is fully organised and supported with a team of guides, cooks, sherpas and porters to accompany you. ​In recent days we have developed some home stay treks in Nepal called village tourism for sustainable tourism, to generate the income for local people in rural area. Chitwan Chepang Hill trails, Langtang Tamang Heritage trails, Ghale Geoun – Ghana Pokhara, Ruby valley trek, Rara trek are few to name. In this Himalayan treks you may stay few nights with a local family or in an alternative ‘home’ such as monastery with guest accommodation, or a large family house which has been extended to provide rooms for paying visitors. Accommodation and facilities in these home stays tend to be very simple. Please contact to us if you are considering a trip which includes home stays and would like more detail.